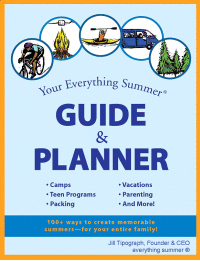 Summer is fast approaching, and for many children and teens, the core part of their summer plan is firmly in place. Perhaps a child will be returning to overnight camp for 2, 3, or 7 weeks. A teen might have applied for and enrolled in an academic program that will allow them to spend several weeks on a college campus, or enrolled in a service and adventure trip that will allow them to travel domestically or abroad. It is very valuable for children and teens to build their summers around a primary interest or experience, as these longer-term programs can have tremendous impact. However, it is very rare for any single program to last for the duration of the time that a student is on summer vacation. So what can you do to fill the weeks of downtime, and ensure that your child doesn’t spend hours each day becoming one with the couch and television? One key component that good supplementary experiences have in common is that they help a child or teen balance their summer. If a child is going to be spending the majority of their summer at an overnight camp, they might enjoy filling in their downtime with a supplementary coding camp, or short-term academic program. Conversely, a teen who is planning on dedicating the majority of their summer to academics will likely benefit from using auxiliary experiences to have fun and enjoy the opportunities summer has to offer – a shorter-term adventure or community service program can offer a really nice counterpoint in this regard; or pursuing a creative interest that intrigues them. When planning a summer, it’s important to note that too much of any one experience might be detrimental. A student might be intellectually curious, and particularly interested in exploring a subject that isn’t offered at school like entrepreneurship or marine biology. But, summer break is meant to be a break, and if a student spends the entirety of their summer immersed in academic coursework, they might find themselves intellectually burnt out by the time September rolls around! Similarly, summer should be a time for fun and engagement – however, encouraging them to spend some time exploring an academic interest will help their intellectual muscles stay in shape, and make for an easier transition to the school year. It stands to reason that if the “core” of a child or teen’s summer has already been planned, they will have certain date constraints they need to work around. Additionally, family travel, athletic pre-seasons, summer school requirements, and college application demands can all create similar restrictions. Suddenly, the lengthy summer is not quite as free as you’d imagined, and it can be difficult to find programs that work within the pre-established windows that your child or teen will have available. One solution is to find short-term, one or two week programs that will supplement those existing summer commitments without overlapping. We recommend identifying these short-term supplements that correspond with a child or student’s interest. From computer science to cooking, or physics to filmmaking, it is very possible that you can find either short-term residential options on a college campus, or even local commuter options within your city or geographic area. Another great benefit of short-term programming is that it offers great ways to explore an area without requiring a longer commitment – so if your child or teen might be interested in videogame design or entrepreneurship, a short-term program can be a great way to gauge their interest, and can provide a wonderful stepping stone to a more in-depth, longer program in future summers (or during the school year). Summer offers a unique opportunity to take an extended break from the demands of school – but the length of summer oftentimes means that just one camp or program won’t be enough to keep your child or teen occupied. By taking a measured, thoughtful approach to filling in the gaps to your child or teen’s summer, you will not only keep them active, but can also offer them invaluable opportunities to explore their interests and make the most of the unique opportunity summer provides!